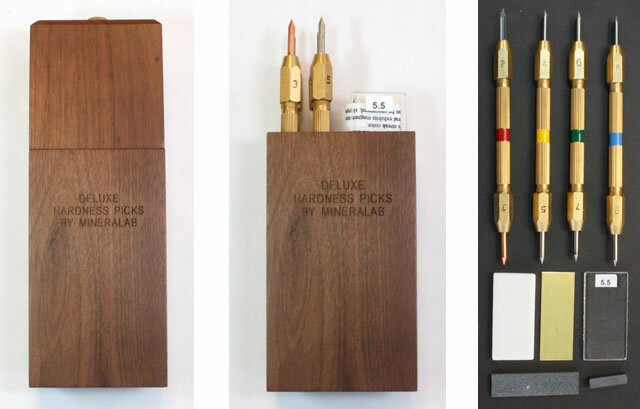 Hardness picks make hardness testing a more precise process - especially when testing small specimens or mineral grains within a rock. The point of the pick can easily be placed on the part of the specimen that you want to test. The scratches that you make or trails of metal that are left behind are usually very easy to distinguish. Simply hold the pick in your hand like a pencil and place it on the area that you would like to test. Then, with pressure, drag the point across the surface of the specimen. It will either leave a scratch, slide without scratching, or leave a trail of metal behind. The set includes eight points - for Mohs hardness of 2, 3, 4, 5, 6, 7, 8 and 9. The 2 is a plastic point, the 3 is a copper point, the others are alloys carefully selected to match the hardness of the Mohs index minerals. All of this in a compact (7" x 2 1/2" x 1 5/8") wooden case that takes up minimal space on a desk or shelf. 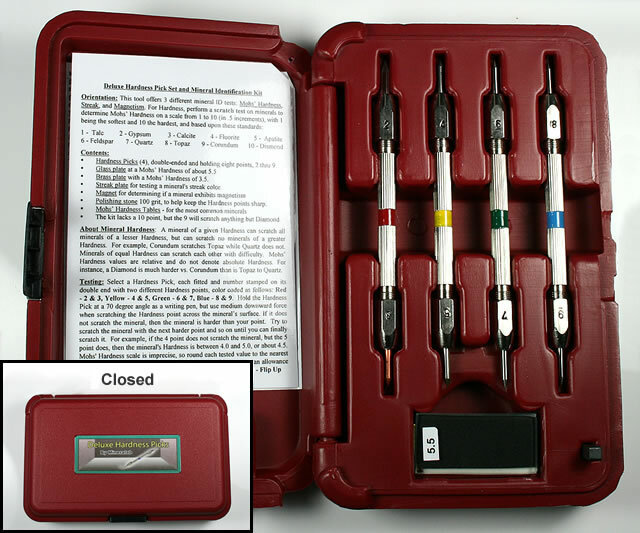 This hardness pick set has the same contents as the kit described above. It is packaged in a durable plastic case for easy carrying in the field. The case opens and closes on a hinge and has a plastic latch. The case measures approximately 5" by 8" by 1 3/4" when closed. 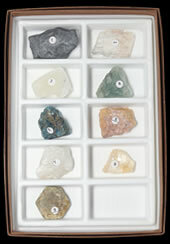 This kit contains nine mineral specimens that can be used to determine the relative hardness of an unknown specimen. It can be used in the field, classroom, or laboratory. 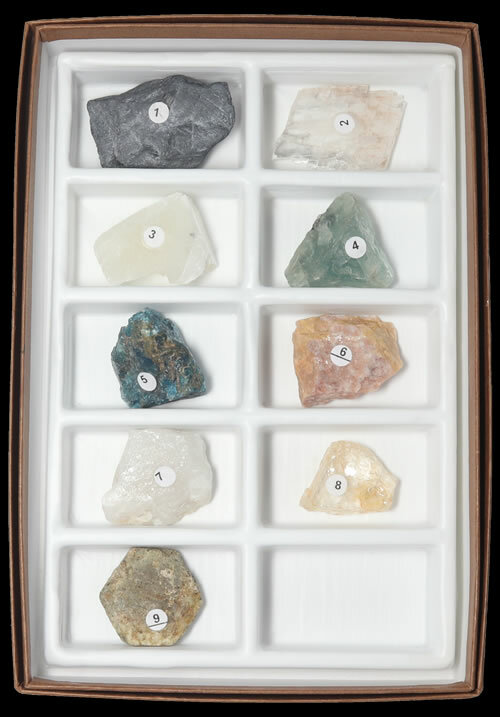 The minerals contained in the kit and their respective Mohs Hardness Scale values are: talc (1), gypsum (2), calcite (3), fluorite (4), apatite (5), orthoclase (6), quartz (7), topaz (8) or beryl (7.5 to 8), and corundum (9). Diamond (10) is not included. Packaged in a sturdy box with a plastic tray to keep the collection organized. Great for classroom use, laboratory use, or personal study. Click on the image for a larger, more detailed photo.